1. Does Earthaven have a single spiritual practice? We don’t have a single, community-wide spiritual practice. Rather, various individuals celebrate Spirit (or don’t) as they wish. What many of us have in common is a reverence for the Earth and our land, and the belief that our land is alive and conscious and it’s our sacred duty to honor and care for it. 2. Do you do have community celebrations and rituals? Yes, and when we do, we often open with an invocation or prayer, a song, and/or by calling in the Four Directions. We set an altar in the center of our group during Council meetings. We attempt to be particularly sensitive to the health and well-being of our soil, our streams, the wildlife with which we share the land, and our forest trees. 3. Does Earthaven value community process and communication skills? Yes. We attempt to share power widely through our consensus decision-making process, so that everyone who is an active member has a voice in our Council meetings. We schedule Check-ins, Threshings, and Heartshares when needed. We have used Arnie Mindell’s ‘Process Work,’ Joanna Macy’s ‘Truth Mandala,’ and the ‘Gifting Circle’ process in our special all-day group process meetings. Through our ReMembership Covenant we encourage members to communicate with each other directly when they have a grievance. We encourage mediations between members to settle disputes, with a third person serving as mediator. Our Care Team regularly checks in and offers counseling or other services to people who may need help of some kind. We teach consensus decision-making throughout the year. See our Calendar. 4. Does Earthaven focus on personal growth and emotional healing? 5. 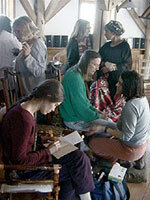 Which spiritual paths and emotional healing methods do various individuals practice at Earthaven? This varies somewhat over time, and has included meditation practices of various kinds, prayer, a prayer circle, devotion to various spiritual teachers (Gangaji, Osho, Swami Parmananda, for example), yoga, Qi Gong, co-counseling, hypnotherapy, the Enneagram, Arnie Mindell’s Process Work, empowerment and despair work/Deep Ecology workshops, men’s groups/New Warrior Training, journaling, massage, energy work, Reiki, homeopathy, shamanism, and flower essences, to name a few. 6. Is there an emphasis on health, nutrition, and physical healing? Yes, but again, as individuals, not through community policy. We teach workshops on herbs and healing, fertility awareness, and women’s health throughout the year. See our Calendar. We have many diet choices at Earthaven. Some are vegetarians; some have been vegans; most are omnivores. Some members raise livestock. We encourage our members to buy organic, locally grown or raised food. 8. Do you share meals as a community? Some members cook their own meals in their homes, and others are members of the shared Hut Hamlet, Bellavia, Medicine Wheel, or Village Terrace kitchens, sharing meals and food expenses with other members of those neighborhood kitchens. Once a week (and sometimes more) members gather for potlucks, including a cook-out every Tuesday and Friday. Members hope to construct a community-wide kitchen and dining room building. 9. What kind of social life is available at Earthaven? The community regularly plans social evenings, such as music jams, movie nights, and casual gatherings for conversation, games, snacks, and beverages. People host dances and parties (and sometimes a wedding) in our Council Hall. Frequent, spontaneous drumming circles occur around the Council Hall campfire circle. 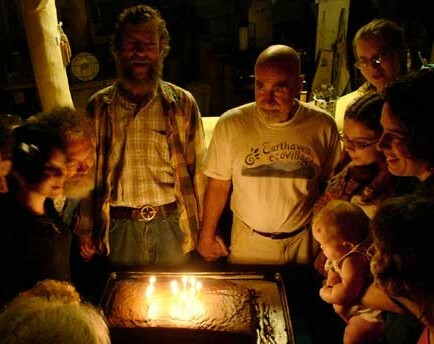 Various special interest groups can include (taking a recent month as an example) an Enneagram study group; a weekly video on Eckhard Tolle’s The Power of Now; yoga practice several times a week; Qi Gong practice several times a week; Crafty Tuesdays, a weekly sewing and craft circle; a periodic sobriety campfire circle; and a Sunday morning nature walk. 10. Are art and music important at Earthaven? Yes, in varying degrees to various individuals. The members who designed and built the White Owl Lodge made it exceptionally beautiful and artistic, and many of our earth-plastered natural-built homes are works of art. Some members bring in income through their art; others express themselves artistically in their daily lives for the beauty and pleasure of it.